Hua Hin has grown in popularity over the last few years as a beach resort town on the Gulf of Thailand which is about 200 km to the south of Bangkok. Hua Hin is one of the districts in the province of Prachuap Kiri Khan which is on Gulf of Thailand. 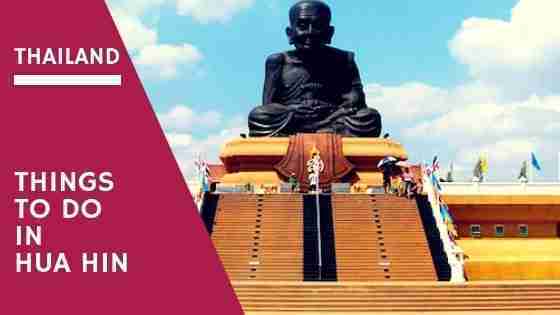 Checkout our travel tips before going to Thailand and some interesting Thailand fun facts. Hua Hin offers the beautiful gold sand beaches, restaurants for the foodies, lively night market, usually beach activities and many other attractions like temples or hiking. Here are the things to do in Hua Hin Thailand. 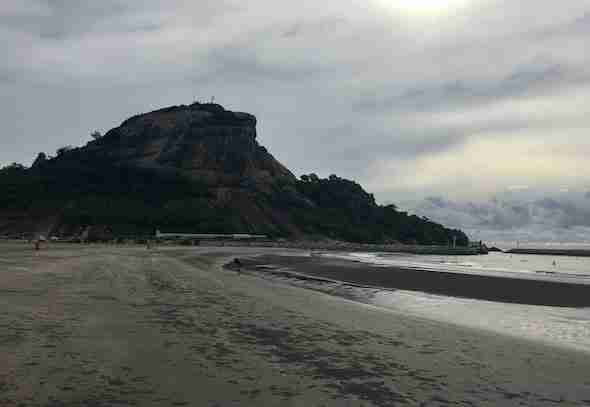 Hill of Khao Takiab is a familiar sight in the Hua Hin area. Plus there is a beach behind it which offers the perfect spot to just chill out. It is a fairly good beach if you are with your friends or family because of the presence of shallow water and plenty of sand which is available for the fun beach games. The north part of a beach is home to various restaurants. Southern end of a beach has the significant advantage of a shade from impressive pine trees which as grown in the place. It’s easy to get there since it is 6.5 km away from Hua Hin town center. You cannot miss the hill and the beach. When you visit Khao Takiab Beach, it’s worth to climb the hill as you benefit from the fantastic views which you will get to see when you get to the top. Vana Nava Water Jungle, Asia’s First Water Jungle and it is one of the best water activities in Hua Hin. The Vana Nava Water Jungle has transformed an empty plot of land into a tropical jungle, with over 200,000 plants and trees delivered from across Thailand. Its very clean and tidy with all the amenities and facilities you would expect. The park has amazing slides, swimming pools, wave pools and friendly staff. 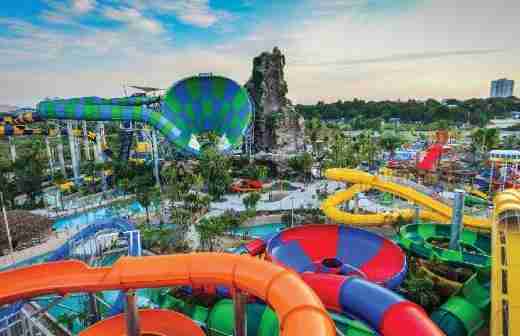 Good place for both adventurous and water park lovers. 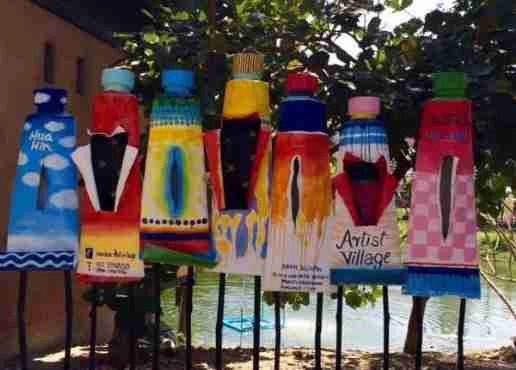 As the name suggests Baan Sillapin Artist Village is an artist village in Hua Hin. The village was opened in 1998 where it has served as a base for the Tawee Kesa-ngam which is a well-known artist in that area as well as other Hua Hin Artists. Many artists are the members of the family of Tawee Kesa-ngam. If you are interested of checking out the artists village, it is not very far the Hua Hin city centre. In Baan Sillapin Artist Village, you will also the artist studios and galleries and if you are feeling very artistic, you can join a sculpture and painting classes. 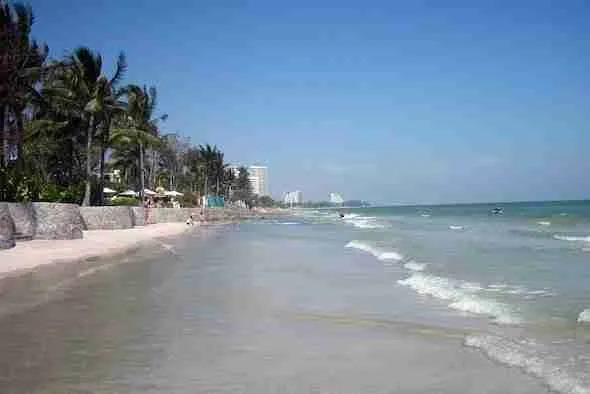 Hua Hin Beach is a popular tourist spot. With its length of about 6.5 km and blue waters and packed deck chairs. The beach is the place where many beachside restaurants are located. If you are wandering along, you will find secluded areas along Hua Hin Beach where you will sit down and relax. With bars and the restaurants dotted along this beach where you can stop and get a drink. Hua Hin Railway station is the landmark of Hua Hin, with was built with a unique design. It was built during the reign of King Rama VI in 1910. And was rebuilt in 1926. 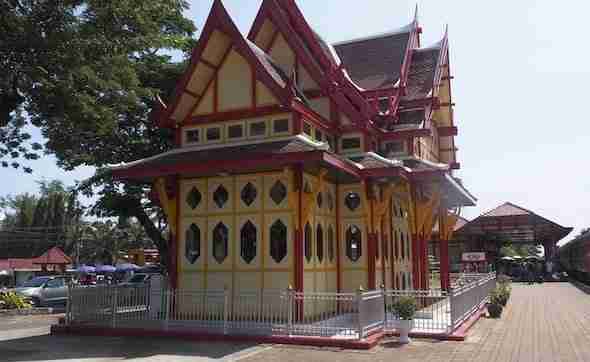 It has a ‘Victorian’ feel but has a Thai in concept with its red wooden buildings. Plus there is a Royal Waiting Room for the king when he is visiting the town. This is another popular attraction to checkout while in Hua Hin. There is numerous markets in Hua Hin such as the night Bazaar and night market. The Cicada Market is considered one of best outdoor markets in Thailand that offers the usually food and souvenirs you expect to see at Thai markets. But also it is the place where the local designers and artists display and then sell their work. At Cicada market, you will see different souvenirs that include clothing and handmade decorations that you won’t see in other markets. There is plenty of places where you will can to sit down, rest and enjoy life. In the food zone, you can get interesting food offerings which include the array of the traditional Thai cuisine which you will enjoy. 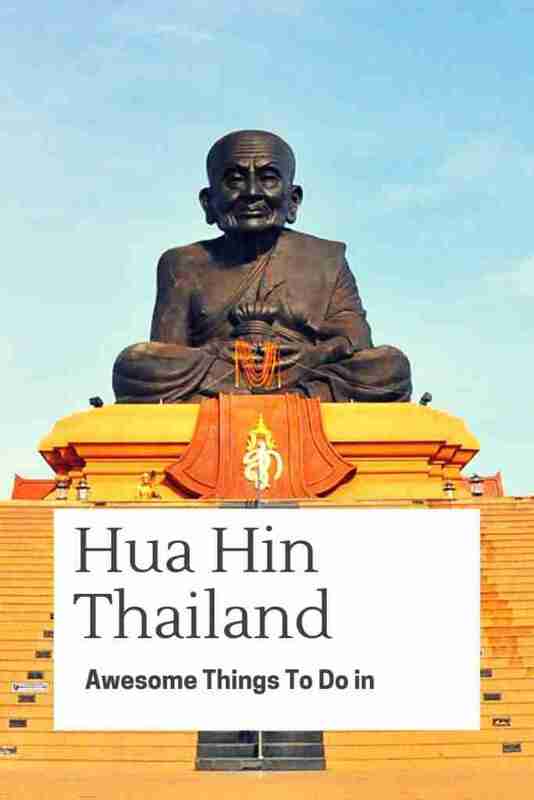 The well-known attraction of Hua Hin is a statue of the Luang Phor Thuad which is Huay Mongkol Temple. This statue was the famous monk in Thailand where it was built in his honor. 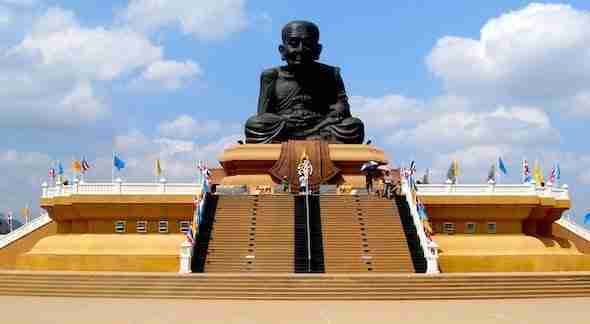 Size of a statue is incredible and inspiring as its height is around 40 feet and the width is approximately 32 feet. As you may imagine, the statue can be seen from long distance away. Huay Mongkol Temple is a little bit outside Hua Hin city but worth the 30 min drive. Sometimes crowded with busses loaded with Thais. You will notice that this statue is popular with the Thai people as they usually come from the entire country to request a favour from the Luang Phor Thuad. There is loads of outdoor activities in Hua Hin that will keep you busy. These are is the popular things to do in Hua Hin for the more adventurous activity. Diving – Hua Hin islands has stunning reefs and coral formations and abundant marine life, makes an excellent place for scuba diving. Snorkelling – Warm and shallow water with abundant coral reefs offer the awesome snorkelling experience. Kayaking – Hua Hin offers a great chance to explore the sea and to learn to kayak. 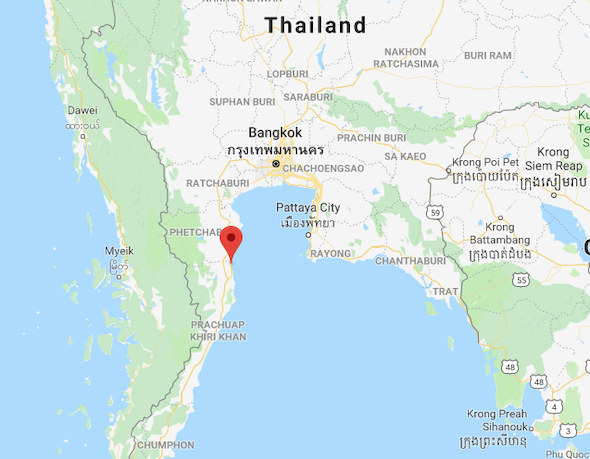 Here is the location of Hua Hin Thailand on the map. Hua Hin has a reasonable supply of guest houses, hostels and hotels. Here are a few places to check out if you are planning to visit Hua Hin Thailand. Smile Resort offers comfortable rooms with air-conditioning. The resort features an outdoor swimming pool, restaurant and free Wi-Fi. Each room is equipped with a private balcony and flat-screen TV with cable channels. Hop Inn Hua Hin is situated in Hua Hin. This property is located a short distance from attractions such as Hua Hin Clock Tower. All rooms in the hotel are fitted with a flat-screen TV with cable channels. The units include a desk. The rooms in the hotel are fitted with a flat-screen TV. Rooms are complete with a private bathroom equipped with a shower. Finally, you can stroll along these beaches all day long, swim in the water and then relax for the cold drinks at some of the restaurants and bars. You can also explore the Hua Hin’s markets where you will interact with local people to get the sense of a town’s inviting atmosphere. Don’t forget the live music which is performed there and the weekend art, where you will buy souvenirs at a reasonable price. And that’s it for now! I’d love to know if this guide on the Things to do in Hua Hin Thailand has helped you. Let me know if you have any questions and let me know if you go.